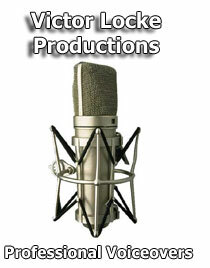 Voice Talent Professional, voiceovers and Imaging Voice for your station. My 40+ years of broadcast experience have included anchoring radio and television newscasts, recording commercials, emceeing public events, narrating industrial/commercial/educational videos and flash presentations for the internet. I also record telephone greetings and messages on hold. I believe in fast turnaround delivering most products via email or uplink to your ftp site. Clicking on these links will take you to some of my past work, including TV imaging spots, on-hold messaging, medical narration, dramatic reading/books etc. Make your You Tube productions sound professional. © 2018, Victor Locke. All rights reserved.